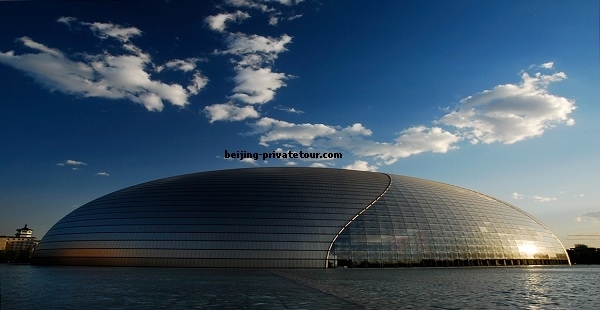 National Grand Theatre , or The National Centre for the Performing Arts (NCPA), is one of the 4 most important landmarks in Beijing. The other three are China CCTV Tower, Water Cube (Beijing National Aquatics Center) and Bird’s Nest (National Stadium). If you are interested in modern contemporary architecture, the egg-shape theatre is absolutely worth having a glimpse. It was designed by French architect Paul Andreu. Construction started in December 2001 and the inaugural concert was held in December 2007. The total cost for its construction is said to be over RMB 3 billion. The theatre has total 5473 seats with each seat costing about half million! The exterior of the theater is a titanium accented glass dome that is completely surrounded by a man-made lake. It just likes like an egg cut half. The Opera Hall in the miidle is used for operas, ballet, and dances with seats 2416. The Music Hall in the east side accommodates 2,017 seats. The Theater Hall in the west side is functioned for Chinese traditional plays and the Beijing opera. with 1040 seats. A 80-meter long underwater corridor connecting the north entrance to Olive Hall of the main building of National Grand Theatre. Visitors come to Olive Hall at the end of the corridor from the entrance. From the Olive Hall, people start to take elevator up to visi the three major halls – The Opera Hall, The Theatre Hall and The Music Hall. The 60% of annual operational cost needed to be subsidized by the government offered by the central government and the Beijing municipal government. The box office of the National Centre for the Performing Arts is located at the north entrance of centre. It is open between 9:30 a.m. to 7:30 p.m. every day. National Grand Theatre is easily accessible either by bus or subway. Pay RMB 30 to visit one of the most controversial architectures in China. You are suggested to spend 2 hours wandering in the ultra-modern building. Your visit to the National Grand Theatre can be independent or combined with other attractions like Tiananmen Square and Forbidden City since National Grand Theatre is just located one block west of Tiananmen Square. If you are short of time, it is still advisable to ge there and take some beautiful photos of the floatng eggshell, which poses sharp contrast to the surrounding buildings. Beijing Modern City Tour : Beijing Day tour of covering major modern contemporary architectures in Beijing.